A popular small lilac tree/shrub that has large dense bunches of highly fragrant double, purple-lavender flowers in May fading to pale lilac in mid summer. They fade a bit more after that but a lot of people call that dead, we prefer the term "heavily restricted life". This particular Lilac tree is considered chalk tolerant so if you happen to leave it in teachers stationary supply cupboard for a while, it won't be picking a fight with the black board writing sticks. In fact we would go a bit further than chalk tolerant and actually say it thrives in chalk. For best results make friends with a Syringa expert and/or plant in full sun. It will do well in fertile, hummus rich, well drained and alkaline to neural soils. Maintenance pruning is advised to remove all dead, diseased and crossing over branches as is a light prune to encourage new growth. Other forms of encouragement such as clapping and shouting "COME ON, DIG DEEP, PUSH THEM FLOWERS OUT" is not as effective as the previously mentioned light pruning. A small height tree/shrub, so expect a height of around 4 metres (13 foot) after 10 years. If you are particularly tall or spend a lot of time on a step ladder you may think it has not grown as much as you wanted. Equally, if you are height challenged then you may think you have purchased a Syringa Monster and received exceptional value for money. So if you are a bit of a short arse, we definitely want a customer testimonial from you. This tree/shrub is supplied at a height of 50-120cm in a 5-12 litre container for year round planting and better results than from either bare-root or rootballed stock. The size range is a little broad because it depends when in the year your purchased it, what the weather has been like and if we have had a recent episode of pruning misunderstandings. 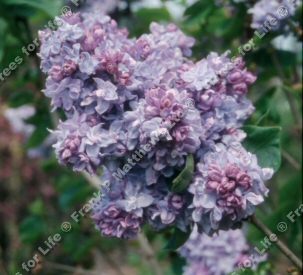 If we are sold out of Katherine Havemeyer Syringa Lilac trees then the Charles Jolly is very similar but a slightly darker purple and the Sensation Lilac tree is almost identical in colour.